One enters in a quite different world during the excursion to Mahabalipuram or Mamallapuram presenting the awe-inspiring rock cut temples near a sea shore offering a thoughtful time for contemplation. 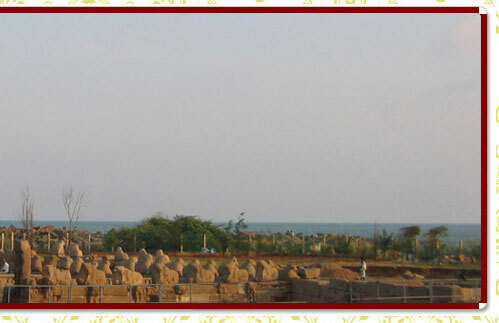 The Land of Pallavas, Mahabalipuram exudes an aura that differentiates itself from the counterpart temples. Built between 7th & 9th centuries AD, Mahabalipuram is a marvel made out of rock, which is recognized by the UNESCO as a world heritage site. Consisting of Vishnu and Shiva cave temples, the centre of attraction here is Sun Temple, Sea shore Temple and Five Chariot . Main Attractions : Descent of the Ganges, Varaha Cave Temple, Shore Temple. Geographic: Located near the city of Kancheepuram is the 7th century port city of Mahabalipuram, once the capital of the flourishing South Indian dynasty of the Pallavas. Famous As : The name Mahabalipuram is derived from Mamallapuram given after the Pallava king Narasimhavarman I, took on the epithet of Maha-malla (great wrestler), as the favourite sport of the Pallavas was wrestling. By Air : The closest airport is located at Chennai. By Road : Chennai, 2 hours, Pondicherry, 4 hours, Kanchipuram, 2 hours. By Railways : Nearest train connectivity is through Chennai. Built between the 7th & 9th centuries AD, Mahabalipuram offers a stunning display of Indian rock cut art that can put Ajanta and Ellora to rival and deserve to be a UNESCO world heritage site. The site is replete with cave temples, monolithic rathas (chariots), sculpted reliefs and structural temples. These edifices were created with painstaking labour, being mostly rock-cut and monolithic i.e. 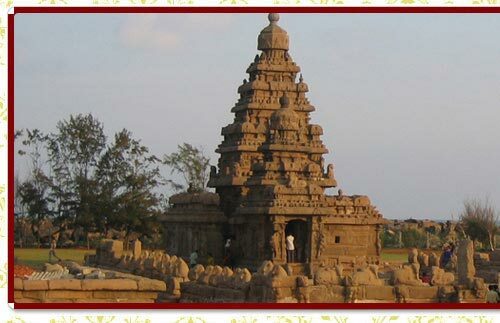 the entire structure is cut out of a single piece of rock, these marvelous pieces of art are part of Mahabalipuram tour. The highlight of any Mahabalipuram city tour, Descent of the Ganges is a giant open-air relief carved of the monolithic rock. The Descent of the Ganges and Arjuna's Penance are the two primary events portrayed in stone. A notable aspect providing ironic yet comic relief in the bas-relief is the figure of a cat standing on one leg (apparently as an austerity), as a depiction related to the Panchatantra of the cat feigning to be an ascetic in order to lure the hare and bird to come near & devour them. Varaha Cave Temple is an example of Indian rock-cut architecture dating from the late 7th century, & is an exquisite rock-cut cave temple. The temple a monolithic, meaning the entire entity was created from a single piece of rock, with a mandapam dating from the 7th century. The doorkeepers in front of mandapa are two pillars and two semi-columns that have horned lions carved into the bases. On the rear wall of mandapa is the entrance in shrine with guardian figures on either side. Inside the mandapa the walls have four large sculptured panels, good examples of naturalistic Pallava art. The flamboyant Shore temple is a massive 5 storey structure built with blocks of granite & is a visual treat. It is so named because it overlooks the Bay of Bengal. The temple is a combination of three shrines with the main & the smaller shrine dedicated to Shiva while a third shrine is dedicated to a Lord Vishnu in a reclining pose.